Part of restarting my environmental and energy management consulting practice has involved sifting and sorting through archived files – electronic and paper – reliving project memories, and deciding what to retain and what to recycle. This is part of refreshing R|CAT. This post is the start of my sharing scoping comments I submitted to the regulatory agency, the California Public Utilities Commission (CPUC), in 1996. I submitted comments optimistically believing I would receive responses to each of my questions. I did not. While in retrospect, I may have been naive, as I review my comments, I am glad to have a record of my 1996 perspectives – many of which are still relevant in today’s on-going environmental and energy discussions, debates, emerging issues, and regulatory and policy framework. Blue Book. If you were directly or even indirectly serving the energy sector in California in 1994, then you know this reference. Remember the California Electric Utility Industry Restructuring pursuits? Remember September 1996 and AB 1890? I do. I do VERY MUCH. I quit an IOU in 1994. Restructuring pursuits served as my inspiration to quit my utility job and hone in on what I could do as part of the future of restructuring. The CPUC issued the Blue Book in April 1994. I was still working for San Diego Gas & Electric (SDG&E). I worked in the Environmental Department, as part of the corporate air quality team. On November 15, 1994, I quit my job to figure out “What’s next?” In 1996, AB 1890 legislation passed. AB 1890. The Electric Utility Industry Restructuring Act (Assembly Bill 1890), became law in 1996. 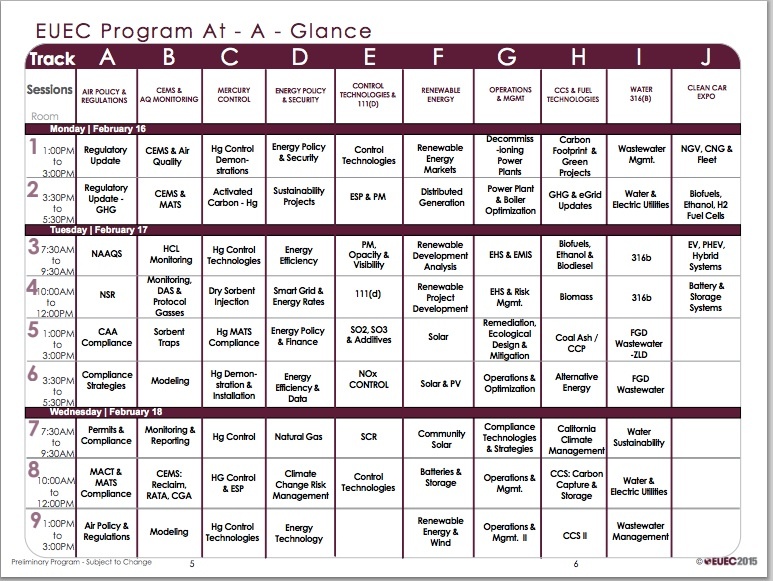 Here is an NREL report over here that includes a summary of California’s restructruring. Prior to passage of AB 1890, the CPUC held several scoping meetings throughout California to receive public comments. Subsequent blog posts will include excerpts of the scoping comments I provided, as well as perspectives about the current regulatory and policy landscape. The anniversary of the 1990 Clean Air Act Amendments. I also have continued to re-establish my business, e.g., professional liability insurance, banking and accounting, small business certifications, digital presence, more detailed qualifications and standard rate sheet, etc. And as observed by a friend whom I met through R|CAT in 2000, many of our colleagues and friends who are still in the environmental and energy business have either moved on to another business endeavor(s) and/or moved up in his/her organizational hierarchy. I met Bob when he was with Delta Air Quality Services, Inc. (Delta) as President and CEO. Bob and his folks provided source test services for many of my San Diego cogen and simple-cycle power plant projects back in the day (and still does for many of them). In October 2014, Delta was acquired by Montrose Environmental Group, Inc. (Montrose). Bob now serves as Montrose’s Managing Director of Air Quality Services. I learned Bob was at EUEC when I saw he was on the same panel as another colleague speaking. Gotta love conferences! Gotta love stacks! * DISCLOSURE: I have NOT been asked to post this on behalf of Bob or Montrose. 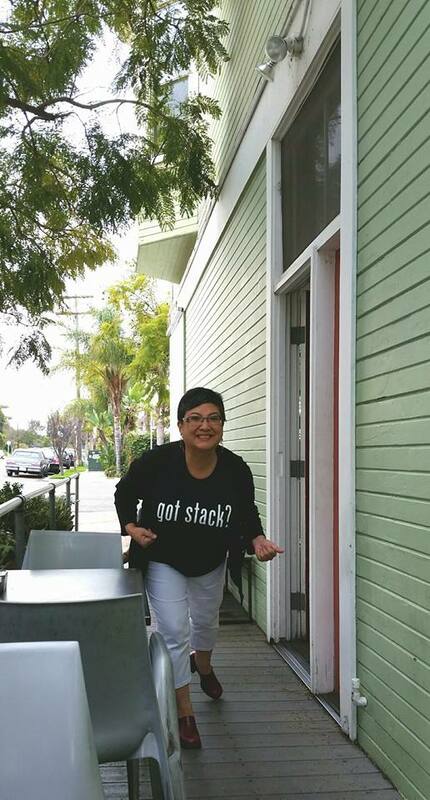 Thank you Montrose for the “got stacks?” tee. This post is about extending an invite to those interested in contributing information about their perspectives, experiences, reference materials, and resources related to ISRs. Also, if you want to rant or rave, I enjoy great stories! Please feel free to CONTACT ME to chat up ISRs. I will be presenting at the EUEC 2015 Conference next month on the ISR topic. As part of preparing my 20-minute presentation, I am surveying and talking with agency and industry colleagues regarding their perspectives and experiences. I also am compiling reference materials and resources that may be helpful. My understanding is that there continues to be ISR information not yet part of EPA’s database (discussed over here). How do I know that? I have found myself encouraging people to submit their information. In short, I believe each stakeholder party – affected public, project developer, agency, lawyer, source tester, policy maker, consultants, etc. – would like to assure that representative ISRs are used. Default value (0.50) aside, the ISRs are party-neutral. They are derived from measured values and/or estimated mathematically based on various assumptions. Having been with EPA Region 9 from 2007-2014 in the Air Permits Office, I was part of a group that was responsible for permit preparation and/or oversight (e.g., PSD, NSR, Title V), as well as supporting other intra-agency groups and inter-agency groups with air quality-related issues. Like all agency personnel, I had the opportunity of not only understanding the agency’s (and partner agencies’) perspectives but also industries’ and public-at-large perspectives. This applied to ISR issues. 1-hour NO2 Standard – Because Region 9’s jurisdiction includes California, air quality modeling of 1-hour NO2 was already being performed for those projects triggering the state requirement; California has had a state ambient air quality standard for 1-hour NO2. Initially at 0.25 ppm, California later adopted in 2007 a 1-hour state standard (0.18 ppm NO2). With regards to the federal standard, in 2010, EPA adopted (after only have an annual standard) a 1-hour NAAQS of 100 ppb in “[t]he form of the 1-hour standard is the 3-year average of the 98th percentile of the yearly distribution of 1-hour daily maximum NO2 concentrations.” In short, the federal 1-hour NO2 NAAQS is relatively stringent. 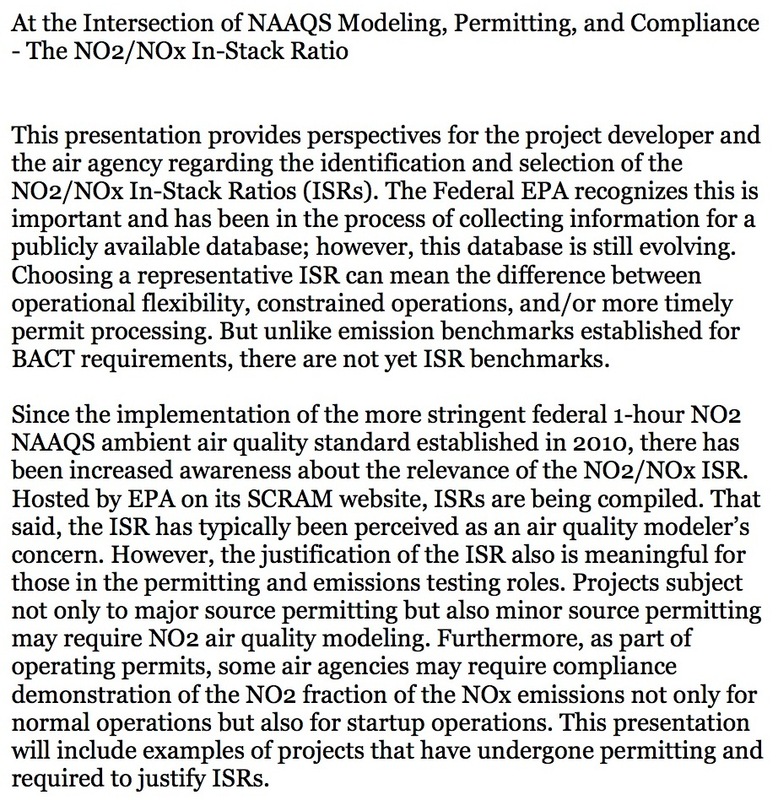 Without going into too much nerd-speak, the importance of the ISR is that it can potenitally contribute to a “go” or “no go” decision for a project requiring 1-hour NO2 NAAQS modeling. Again, feel free to CONTACT ME to chat up ISRs. * EPA’s website contains updated information and guidance since the database/data collection was initiated; however, with ISRs, the process generally remains the same. 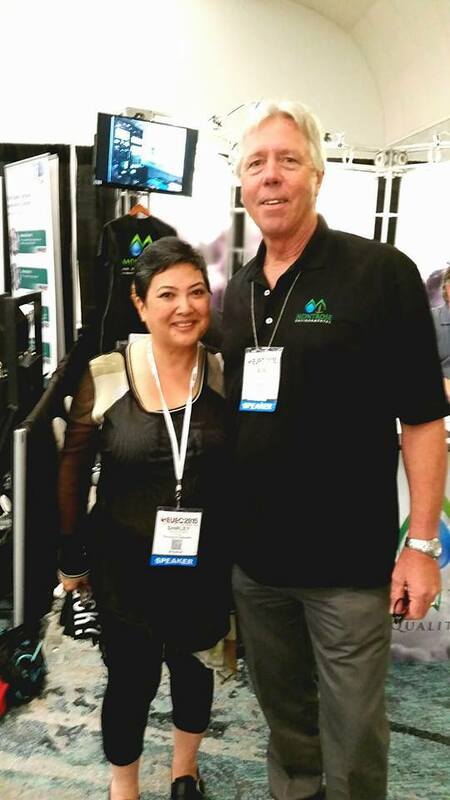 Thank you to EUEC @EUEConference for the opportunity to be part of your 2015 conference in San Diego. I am looking forward to sharing and exchanging information, as well as reconnecting with many of my colleagues as I refresh R|CAT. This post includes my abstract submittal, along with general information about the conference. Want to talk about my presentation before, during, and/or after? Feel free to contact me. My presentation is on Wednesday, February 18, in a morning session. I will be among four other speakers during the 2-hour session and the last to present among our panel. With the conference located in San Diego, California, having lived there, I can say that the weather typically is mild in February. There are so many choices of presentations to attend with ten subject matter tracks and three days of presentations, exhibits, and networking events. As mentioned, I look forward to meeting with colleagues whom I have seen for nearly five to ten years. But for now, I am finishing up my presentation.